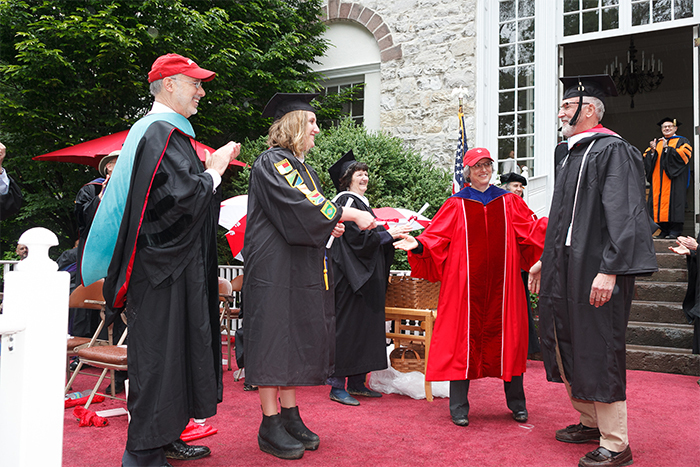 Moments after receiving her own degree, Anna Wagman '16 helped award a diploma to her father, Joe Wagman '16. Photo by Carl Socolow '77. As she descended the steps of Old West on May 22, Anna Wagman ’16 became the first member of her family to graduate from Dickinson College. But that wouldn’t last long. Seconds later, another member of the Wagman family appeared at the top of the steps—Anna’s father, Joe. In a Dickinson first, the tradition of a family legacy delivering the diploma was executed by a child delivering to a parent, rather than the other way around, and the crowd reacted with a swell of cheers. “We’ve always been really close, so it was great to be able to share this with him,” Anna said after the ceremony. She earned a B.A. in anthropology and will study health care management at Emory University’s Rollins School of Public Health in Atlanta. “It’s nice that Dickinson has a tradition of legacies, and to have this little bit of a spin on it with my daughter giving me the diploma was great,” added Joe, who spent eight years taking one class per semester to earn his B.A. in archaeology. The CEO of Wagman Construction plans to take some time off before deciding how exactly to put his new degree to good use. Read more about Joe’s path to becoming a Dickinsonian in the upcoming summer issue of Dickinson Magazine.